Velcro seal above neoprene opening makes storing cell phones, wallets, and other valuables discreet and secure. Not good for coins or other loose money. Metal bottle/can opener in front pouch pocket is attached to a elastic cord via a split metal key ring. Hangs about 12 inches down from the top of pocket. 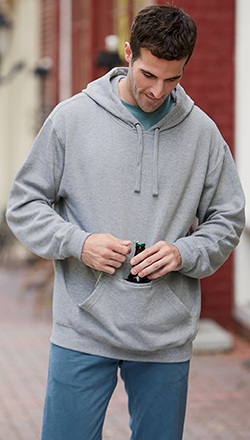 Bottle opener is removable for washing and drying hoodie; cord's sewn in.